Lovely red jelly with a glorious gold shimmer shot through, it’s a little darker than it appears in these pics, and is all the nicer for it. 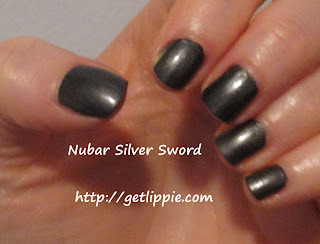 Both pictures show two coats over a Mavala base, and with a Seche Vite topcoat. I could actually have got away with one coat, but I wanted to apply two, just to see how the colour came out. I’m glad I did. 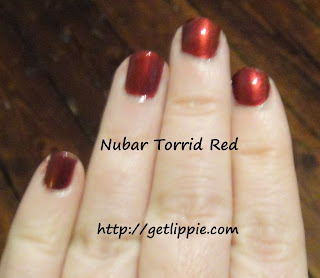 Formulation is a bit on the thick side for Nubar, but it applied and dried very nicely. Picture of the ring finger there is a fairly accurate representation of how the colour looks in normal light. Just lovely! 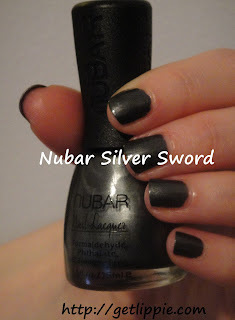 Above pic shows two coats with a top coat (think it’s from No. 17) application was good, and this is a lovely finish which doesn’t seem to be blighted with brush strokes. Looking forward to trying this one myself, it looks lovely! I will bring you more shades from both of these collections next week. Which do you prefer, the greys or the reds? 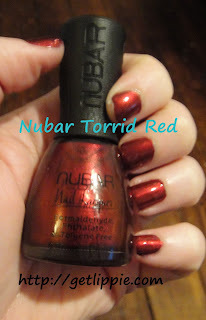 Nubar polishes are available from Beauty Shed, and cost £8 each. The Small Print: I was sent this for review purposes, so I reviewed them. I’m nice like that 😉 All opinions are honest, regardless of the source. The greys appeal to me much more! The greys are lovely, and, while the reds are nothing unique, *I* think they're beautiful! Oh you're not wrong, I love reds, love them. I just don't wear them much as I always feel a bit ostentatious!